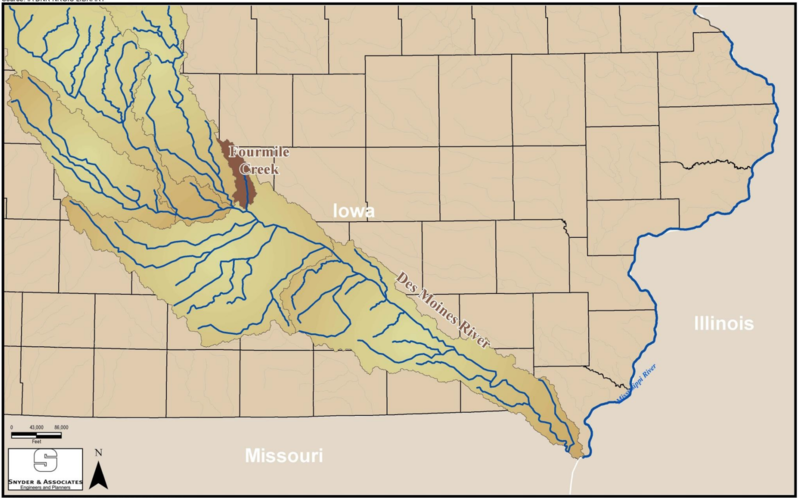 Fourmile Creek and its tributaries run for over 40 miles before draining into the Des Moines River. Along its path, the creek has a long history of extreme flooding, erosion, and poor water quality. To address these diverse issues, local communities created one of the first watershed management authorities in the state in 2012. This WMA focuses on collaborative work to address flooding and water quality. The primary focus within Fourmile Creek is to reduce flooding. With growing urban areas and increasingly common large storm events, flooding continues to cause damage in the watershed. To mitigate this damage, ongoing efforts focus on holding water in upland areas of the watershed, by utilizing practices such as regional detention basins and wetlands. Policy changes are recommended within urban areas of the watershed. Preserving stream buffers and floodplains protects urban residents and allows mother nature to function as intended. Fourmile Creek has several water quality issues including excess nutrients, sedimentation, and bacteria. Across the watershed work must be completed in both urban and agricultural areas to improve water quality. In rural areas efforts are underway to partner with farmers to increase the adoption of practices such as cover crops, reduced tillage, and stream prairie buffers. Within urban areas, cities and homeowners must focus on treating stormwater runoff. Residents can make simple changes such as picking up pet waste (bacteria) and reducing fertilizer use. They can utilize cost share programs to reduce runoff by installing rain gardens and soil quality restorations. Cities and counties must also work together to reduce runoff and stabilize eroding sections of stream. Our document's section is comprised of Quarterly WMA Meeting Notes, which can be downloaded at your convenience. Never worry about missing a meeting, our team will upload meeting agendas and notes.